Chess Olympiad 2008 round 1 live! 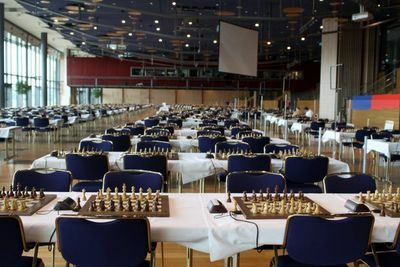 Welcome to the live updates and reports coverage of the Dresden 2008 Chess Olympiad on Chessdom.com! In the next weeks we will closely following the events from Dresden where a record breaking 152 nations and over 1350 players will participate. The games from the parallel senior and school tournaments are already underway in Dresden. 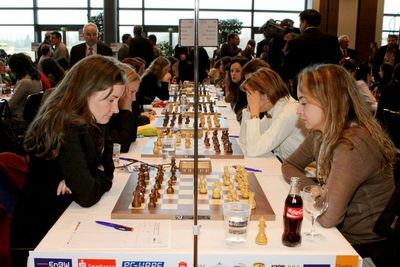 The round 1 of the open and women sections of the Chess Olympiad start at 15:00 CET. The team of Russia is the rating favorite at the Olympiad. 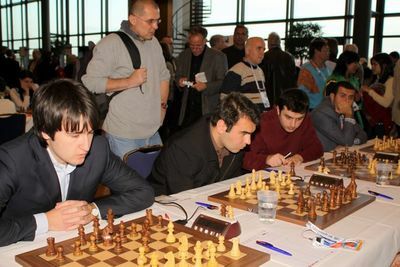 They have average ELO of 2756 and are led by the World Championship finalist Vladimir Kramnik. Ukraine with Ivanchuk, China with Wang Yue, and Azerbaijan with Radjabov complete the list of countries with average ELO over 2700. Among the top 10 participating nations is Hungary, who as already announced line up Peter Leko and Judith Polgar at boards 1 and 2. Bulgaria is 6th seeded, only after Veselin Topalov confirmed his participation at the Olympiad officially yesterday after the Kamsky – Topalov match letter has been sent to FIDE. The young team of France, the experienced Israel, and the dream team of USA also enter the top 10 seeded. Russia, Ukraine, and China are top seeded in the women section of the as well. Russia is only 9 points ELO away from the dream rating average of 2500. However, they will not have easy task as the teams of Kateryna Lahno and Yifan Hou are ready to attack the top position. Georgia, USA, Hungary, and Poland also bring strong teams, and who knows which will be the surprising underdog at the Olympics. Stay tuned for the pairings of round 1, we will publish as soon as they are all available. 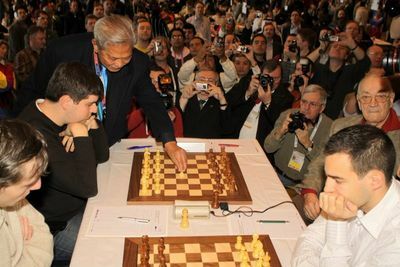 This is an Olympiad featuring many ex and current world chess champions in classical, blitz, rapid, chess960, etc. However, what more attracts the attention is the surprising and interesting duets on boards 1 and 2. We have already mentioned Peter Leko and Judith Polgar for Hungary. For England it will be Michael Adams and Nigel Short. Norway is led by Magnus Carlsen and his teacher Simen Agdestein. Bulgaria, in a similar manner, line up Topalov and his second Cheparinov. 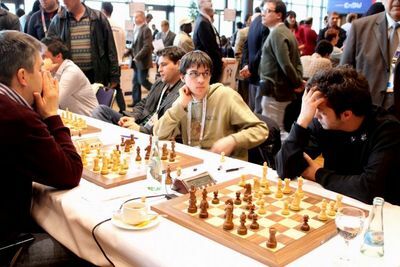 India put on top the youth of Sasikiran and Harikrishna, similar to Azerbaijan with Radjabov and Mamedyarov. Many more teams will put their hopes on the young players and we will see Wesley So, Yifan Hou, Vachier-Lagrave, Sergey Karjakin, Dominguez Perez, Arkadij Naiditsch, and Jan Smeets in some top boards action. In a true Olympic spirit Africa has send many representing countries at the Olympics. Among them we can note the rise of chess in the region with participating GMs Slim Belkhodja, Amin Bassem and Ahmed Adly, all veteran campaigners at the World Chess Olympics. Grandmasters Zambian Amon Simutowe and Zimbabwean Robert Gwaze are the new stars, it will be interesting to see how they perform at such a major event. Latest info from Dresden: pairings will be available at 13:00 CET. As soon as we have them at the Chessdom office we will post them. Stay tuned! This Chess Olympiad will be quite innovative regarding the rules. One of the most peculiar is the “no short draw” rule implementation. According to article 3.1 from the Players and Captains section, “Draws are NOT allowed before the completion of Black’s 30th move. This shall be superseded by Article 9.1 of the Laws of Chess. In case of doubts, the Chief Arbiter’s interpretation shall be final and without appeal.” (read full info about the no short draw rule). Besides, in the first round, two `imaginary` match points shall be added, for pairing purposes only, to each of the teams in the top half of the initial list. That means that in an Olympiad with 120 teams, the pairings for the first round will be 1-31, 2-32, 3-33 … 29-59, 30-60 and then 61-91, 62-92, 63-93 etc. (instead of 1-61, 2-62, 3-63 etc. in previous Olympiads). Details about this rule and the board number changes at the Olympiad rules section. Still no news from the playing hall about the pairings, nor from the official website. If any of our attentive readers have information about the team or board pairings, please, send it to our contact form. Also, feel free to send news and comments or anything connected to the Chess Olympiad. Right as we said that reaction came from Dresden. The pairings are now available, top board will be Russia – Switzerland. Stay tuned for full list in a few seconds! 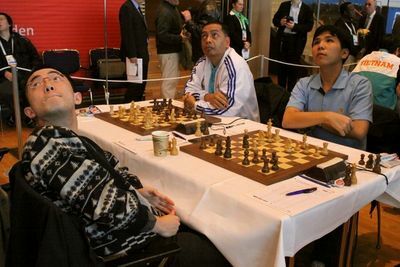 The round 1 of the Chess Olympiad 2008 starts in 1 hour and 15 minutes. All games will be live on the official site, but in case transmission fails we will try to keep live scores updates of the matches. The Indian media has wide coverage of what is going on in Dresden. However, their main concern is the absence of Anand and pessimism seems to be filling the media reports. With the current solid play of Sasikiran and Harika at the European Club Cup surely India stands to be one of the favorites of the Chess Olympiad. This is the spectacular playing hall that will soon be full of players, coaches, journalists, and accompanying people. 15 minutes to the start of the games and players have started entering the playing hall. Now the playing hall is quite busy, with arbiters ready to start the clocks when instructed by the tournament directors. Several readers have asked why Morozevich is playing board 3. The decision of the boards list is made by the Russian captain Alexander Bakh, we will surely ask around for more information. And the games have started! The players are not in a hurry in the opening moves, trying to get comfortable with the size and atmosphere of the event. No short draws are allowed, so a lot of action expects us today! Live games will be available here. Magnus would consider a top-20 result in the Open group a success despite the pre tournament 19th rank as there are many strong teams with only a slightly lower average rate (for instance Netherlands, Poland, Serbia and Belarus to mention those above 2600). Russia is top ranked with an amazing 2756 average rating, USA is no 10 with 2673 while Germany on 11th has 2647 and is only 36 points ahead of Norway., comments Henrik Carlsen. At this moment Magnus is cruising smoothly through the opening of his game against Markus Ragger, who will surely put up a fight today. Barileng Gaealashwe from Botswana follows Jorge Picado and scores against Kofi Leonard from Ghana, however, this time on time forfeit as the Ghana player did not show up. The same type of victory was registered in a much stronger match GM Sanduleac won on forfeit against IM Karim. The World champion Vishy Anand may not be here, but his long time second Peter Heine Nielsen is doing a very good job and already has a nice position. At the meantime Viktor Kortchnoi puts up a good fight against Svidler. The women of Egypt are already two points ahead after victories of AlGohary Maiada and WGM Mona Khaled. Their match will probably be the first decisive one of the day. The new Chess Olympiad rules seem to have an immediate effect. No short draws are seen, while the new pairing system produces some very interesting games on the top boards in the first rounds. With the absence of Rafael Leitao on board 1 for Brazil, Darcy Lima has the honor to defend his flag. His task is not easy today, as he is against the Serbian champion Ivan Ivanisevic, who is steadily going towards the 2700 club. India media reports could turn right. A shocker for India as GM Sandipan draws against IM Noritsyn! The 200 ELO points advantage was not enough for Sandipan, who drew in 16 moves. Now it all depends on the top boards, Canada will have their chance here! Even though players are not allowed to offer a draw before move 30, the game has reached a 3 move repetition, which is fine with the rules. Iraq is on the right track! Two wins by FM Hussein and FM Hussein give Iraq advantage over the US Virgin Islands. First photos from the round are available thanks to Chessdom’s good friend and frequent contributor Susan Polgar. Here is the team of France with Vachier-Lagrave and Bacrot, both playing solid chess today. 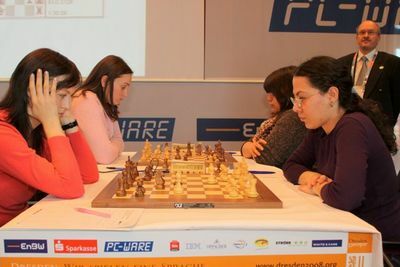 Anna Zatonskih and Jovana Vojinovich in another interesting game. GM Hamdouchi and GM Iordachescu reach a draw. This makes the score 1,5:0,5 for Moldova. It is possible that the move from this game are not available for some of the users of the official website, but the score is official. Very equal game by Carlsen and Ragger. We are going to witness how both are dealing in the coming endgame. However, Magnus will have time advantage, as he has 53 minutes, for only 28 for Ragger after move 30. 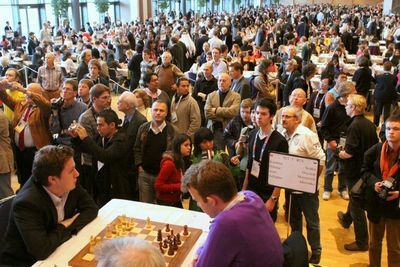 The crowd at the Chess Olympiad watching the games. 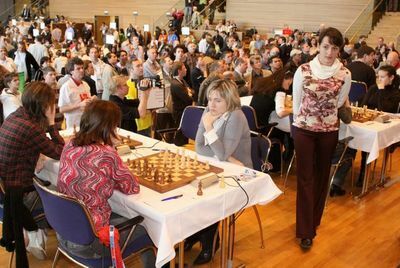 ALexander Morozevich clinched a 25 move victory against Jenni Florian. Russia proves to be the favorite of this competition and starts with a strong victory on board 3. 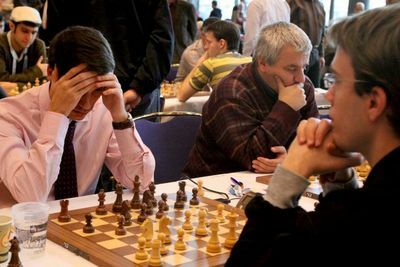 Morozevich seems to be in form, he will go for the gold medal for sure. 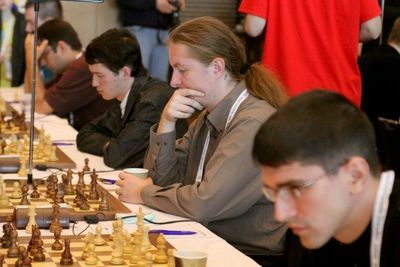 Last year, at the European analog of the Chess Olympics – the European Team Championship – Russia managed to take basically all the top spots and board medals in the men and women sections. GM Adly and GM Nisipeanu agree on a draw on move 31. This is yet another consecutive draw for the Romanian player, after he finished all his games draw at the ECC a few weeks ago. IM Hafizulhelmi Mas opens the score for Malaysia in what seems to be an easy match for his country. Carlsen is falling into a difficult position after his attack has been unsuccessful. Ragger may bring the surprise of the day! At the same time Aronian will bring the first point for the defending champions Armenia. He declined several times the exchange sack of Caruana and is on the way to victory. Akopian is also on the way to bringing a full point to Armenia. Good for by the defending champions. Azerbaijan score as well, Mamedyarov does not leave chances to Trajko Nedev. We might have a first round full of surprises. Besides the already mentioned, there are several games where 300 ELO lower rated opponents win. Such is the case of Chinasamy (2086) for Mauritius, who surprised IM Amanov (2357) from Turkmenistan. GM Vachier-Lagrave goes in the surprises list as well after drawing with GM Drasko Milan. It was a three moves repetition. Does Montenegro have a chance in this match? And more surprising draws ahead. GM Kamsky draws with GM Stefansson, GM Roiz is held by GM Miezis, and GM Illescas trips against GM Naumann. The Czech Republic open their account against Australia. GM Babula wins against IM Xie. However, anything can happen in this match and the most interesting is to come. No scores until now on the top 15 matches in the women section. Ragger has dropped his advantage against Carlsen, and the Norwegian has equalized. Scores started flying in the women section, without surprises up to now. IM Nadezhda Kosintseva had no problems against Isgandarova for a full point for Russia. Boards 1 and 2 of China – Yifan Hou and Zhao Xue – won their games against Golubenko and Medic, while the WWCC participant IM Natasha Bojkovic won against WIM Vasquez. The European Club Cup champion Alexander Grischuk draws his game with Yannik Pelletier. Russia – Switzerland 1,5:0,5. GM Bagheri holds GM Balogh to keep Hungary – Iran equal. India trips again! Second draw, this time GM Harikrishna and GM Bluvshtein divide the point! Good game by GM Bluvshtein who held his opponent with black. GM Emanuel Berg loses his game from the 200 ELO lower rated IM Gonzalez. Sweden should be able to get the match as GM Cicak won his game, but that is surely a heavy loss for Berg and another addition to the surprises list. However, this is not where the list finishes. Finland are destroying Georgia 2:0 as IM Sammalvuo and IM Lehtinen won against higher rated GM Izoria and GM Pantsulaia. Now Finland needs just a draw to walk away with full points. GM Vajda Levente, the second of GM Nisipeanu, brings a full point to Romania in the match against Egypt. The score is 1,5:0,5. Spain have finished off Germany 3 with a total score 3,5:0,5. Despite the surprising early draw, there were not any serious problems on the other boards. Azerbaijan and Armenia increase their lead to 2:0, while Iceland and USA make a real show and are level 1,5:1,5. Now it all depends on the game GM Steingrimsson and GM Onischuk. Bulgaria and Germany 2 is also a very interesting match. GM Cheparinov lost on board 1 from GM Meier, while the debutant GM Iotov returned the point against IM Bogner. However, we may still call this day the round of the surprising draws, as GM Ghaem holds Judith Polgar and GM Tkachiev could not win against GM Kosic. Greece destroyed Mexico, while as expected Sweden managed to get back in the match and win 2,5-1,5 against Costa Rica. In the women section Russia had no problems against Azerbaijan and scored 4:0, despite the interesting game between Kosteniuk and Mamedyarova. Armenia also have won their match against Italy, while 26th seeded Argentina are giving Ukraine hard time and keeping the score 1:1. More surprising draws – Jakovenko vs Gallagher and Zoltan Almasi vs Moradiabadi. This leaves Russia to depend on Svidler vs Kortchnoi, while Hungary and Iran are leve 2,5-2,5. Philippines are playing their match of the year against China. After GM Villamayor lost from GM Wang Yue, the young star GM Wesley So returned the point against GM Ni Hua. 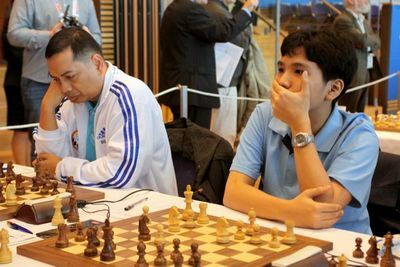 The Philippines champion IM John Paul Gomez drew with GM Li Chao and now it all depends on the game GM Wang Hao – GM Gonzalez. Iran holds Hungary to a draw! At the same time USA wins their match against Iceland. A real tough battle, won by Onischuk in the last game. Georgia is having difficult time losing 2:1 from Finland. In the women section the situation of the Georgians is not easier, as they are level 1,5:1,5 against 31st seeded England. Most matches are heading towards a finish. We will continue posting pictures for you and immediatelly after the round we will start publishing interviews and interesting news stories. GM Ganguly gives India a draw in hand after a victory on board 2. India seem to need Sasikiran badly. Sasikiran is in good form and surely can give quality addition to the team. Slovakia, Poland, and Armenia achieve convincing victories. Gm Kortchnoi holds GM Svidler to a draw. Fine play by the Swiss team, but Russia walks away with the victory. FInal score 2,5:1,5. China’s Wang Hao brought the victory to his team. A good match by Philippines which surely will continue strong in the matches to come. Germany 1 with superb performance winning 3,5:0,5. Strong start for Azerbaijan. Will this be their Olympiad? Usa is victorious in the women section as well, 3:1 against Montenegro. Montenegro stunned France for a 2:2! 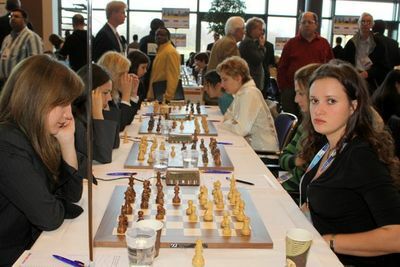 Stay tuned for all the results, interviews, photos, and reports on Chessdom.com!